Hello friends! Today we had a fun day with sports and going to a birthday party. I am happy to have a tutorial on the Simon Says Stamp Store blog today. It's another of those project that started out as something completely different, then I was so inspired by a peaceful winter's walk and changed the theme. Here's a sneak peek. 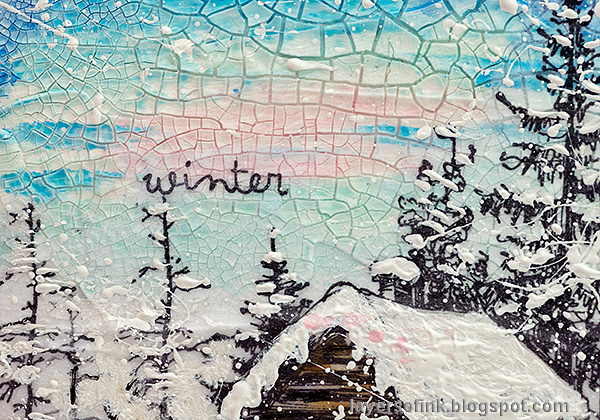 I made a winter wonderland mixed media canvas, using stamps and various media. The cabin comes from Tim Holtz's Scribble Woodland stamp set and I used Ranger's Texture Paste Opaque Crackle to create that amazing crackle sky (I love skies with a crackle texture). This project is much easier to make than what it might look like, and you can find all the steps on the Simon Says Stamp Store blog. See the full project and the tutorial on the Simon Says Stamp Store blog. Thank you for stopping by! Have a lovely day and I will see you tomorrow again. Hi Anna, I saw this yesterday on SSS blog and had to come over to tell you again how gorgeous this is. We have a cabin in the woods over looking a river and it is my fave place to be. I so want to try my hand t a scene like this. Thanks for the tutorial. So beautiful!